IRVING – Ah, the joys of live theater: the roar of the crowd, the smell of the greasepaint and the gunsmoke …Yep, gunsmoke. 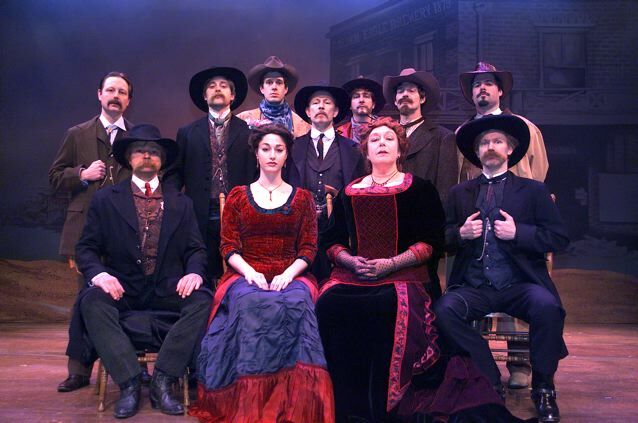 The actors at Lyric Stage are packing real six-shooters. That’s only fitting for a new musical that climaxes with the gunfight at the O.K. Corral. In Sundown, authors Joe Bravaco and Larry Rosler focus on John “Doc” Holliday, the Baltimore dentist who moved to Arizona for his health and became a legendary gunfighter. His saga works well as a musical, Doc himself being worthy of an opera. The best singers in producer Steven Jones’ premiere staging are Kevin Varner as Doc and Gina Biancardi as a version of Katie Elder. Recall Biancardi’s maternal figure in Allegro and you’ll appreciate her acting stretch here as a bawdy belle always ready for One More Drink. That number leads to a hangover of Olympic scope, and Biancardi plays it down and dirty. She fires the show’s first big solo salvo on Bridges, tops herself with Prisoner, then joins Varner on the soaring Another Time. Bradley Campbell is both menacing and comical as Ike Clanton, accustomed to calling the shots in Tombstone.